Last year my high school daughter wanted to make her friends a present for Christmas. The problem was her friends – should she limit her gift-giving to just her closest friends or give to every one in the wider circle? Well, she went with the wider circle, which was at least 12 or so friends. We needed to find an idea that was simple and not too expensive because even a $1 or $2 item adds up quickly when you multiply it by 12! So we settled on charm bracelets. She bought charms that came in multi-packs and then we tried various ribbons and thin cording to make knotted bracelets. Overall, she was pleased. This year, it is my goal to have a handmade Christmas. I know that I always desire to have ALL my gifts handmade (is that a girl thing? ), but I also know that this will not be possible. So I need to think carefully, now, about what I want to make. Even if I don’t make it myself, I’m going to make full use of Etsy this year. In addition, I want to help my kids make their gifts. My 13 yo daughter, the crafty one, made all her gifts last year. For me, she painted a tin with the four seasons and filled it with chocolates. For her younger brother she made him a fur lined hand warmer (like the pro football players use – and he still plays with it!). For her older brother, her annual batch of special family recipe fudge. My ideas are kept all over the place. We have binders filled with craft ideas, sewing projects, and knitting projects. I have bookmarked various items that I think would make great handmade gifts and I also have files downloaded on my computer. For me, the list maker, I have a hard time sorting gift ideas. Should I sort them by the craft (sewing, knitting, etc.) by whom I think would like it, by who is capable of making it? Someday I’ll make multiple cross-referenced lists. But on this list, which is derived mainly from items I have made and given as gifts, I’m going to try to sort the ideas by recipient. I will try to include a link wherever possible. I’ll continue to update this list and post it on my side-bar. I would love to hear some of your favorite handmade gifts! I’m a little light on ideas for men. Digital photo book gift certificate. (Not handmade) This one is quite practical. My daughters love to scrapbook and have received many scrapbook supplies over the years. But a simple gift from Snapfish or one of the many other online photo publishing sites that is a “make your own photo book” is a wonderful gift for teens. T-shirt quilts using their favorite sports teams. Back it with polar fleece to make it extra cozy. 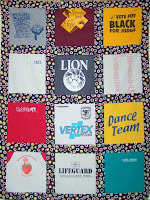 T-shirt quilt (great for grads and the sports enthusiast, too, to use as a stadium blanket. Pattern Magnet. I have a few for sale on my Etsy. They are really easy to make and very useful. I use mine all the time in reading patterns and charts. Take 20.5″ ribbon. Cut two magnetic strips with glue – each 7.75″ long. Apply the ribbon to the magnets, keeping .5″ of the ribbon to overlap the end of the magnet. Secure both ends using a glue gun. Make them in various lengths for various project needs. e with my kids and knitting club. What a great list! I especially love the pattern magnets -I’ve never seen those before. Love the list! I’m looking for inspiration for Christmas gifts as well…I particularly like the Scrabble necklace idea. Have you done this before? Do you have pictures? You have so many great ideas. I especially like the idea of a recipe book and bangles. The charm bracelets you and your daughter made last year sound great, too. I guess I would add fingerless gloves for girls (because I happen to be knitting a pair! ), small felted bags, and felted tote bags made from re-purposed wool sweaters. Oh, another idea is to buy those tiny canvas tote bags at the craft store and decorate them with needle felting or embroidery and fill with dried lavender. You’re welcome for the shout out on my blog, and thank you for following my sister’s blog! Great resources and list. We have been practicing this for a few years and although the first year the kids were a little disappointed with the lack of plastic (i guess 🙂 Now it’s a fun challenge and everyone has a great time. Have a great week!